To change the world, I may lose everything.All Eva ever wanted was the chance to be herself. But in the Americas, to be hybrid—to share your body with a second soul—is not tolerated past childhood. Now Eva and Addie, her sister soul, are constantly on the move, hiding from the officials who seek to capture them. But the tide is changing. A revolution is brewing, and people are starting to question the hybrids' mistreatment. 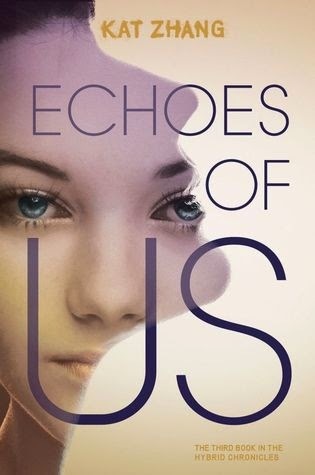 I have loved each book in the Hybrid Chronicles series, and Echoes of Us was no different from its predecessors. The premise of this series is so captivating, and really makes this series stand out in the genre. I fell in love with Zhang's characters, and found myself sad that the series was over. Eva and Addie aren't afraid of anything---and that made them so easy to admire. I love their determination and their ability to effect change in the world around them. They were inspiring characters to read about. I did have a couple of complaints about Echoes of Us. There were a lot of captures and escapes in this book. Just one too many for my tastes. And, the conflict resolution was rushed, in my opinion. I wanted more "after" to the happily ever after. Overall, I really did love this series, and would definitely recommend it. Kat Zhang is an author to watch---I love her writing and I'm looking forward to her next release!